Anti Trojan Virus | How Trojan Horse Virus Affects Your Endpoints? The Trojan horse virus has been around the Internet since the 1970s, exploiting all types of endpoint users for money and confidential information. As the time goes by, the Trojan virus authors created much more sophisticated codes for impactful cybercrime attacks. The Trojan horse virus presents itself as an email attachment or an innocuous file in a USB flash drive. 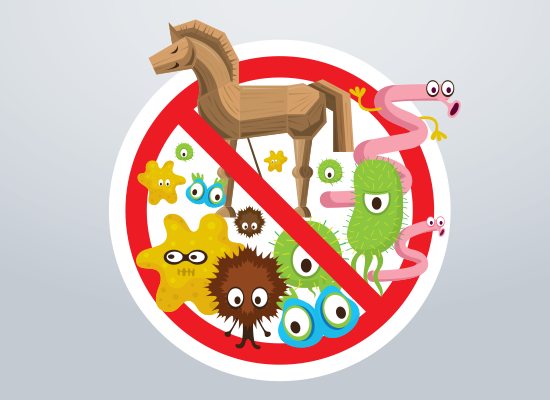 Many users, including experts, can fall as a victim of a Trojan horse virus any time. Comodo AEP has the capability to block malicious or unknown files that are possibly carrying Trojan horse viruses. That quality makes it a good anti Trojan virus. Often times, operating many files at the same and launching multiple applications can slow down the endpoint speed. Let’s take the Rootkit Trojan as an example. It attaches itself to the boot sector of a hard drive. It’s the first one to execute before an Operating System (such as Windows) loads. Thus when an ordinary antivirus runs, the Rootkit Trojan won’t be visible in the Task Manager. It writes autorun entries in the Windows Registry where it remains hidden in the background. A Backdoor Trojan provides cybercriminals remote access over an infected computer such as modifying the Internet browser settings by adding a Proxy Server. Because of the Proxy Server, the users will be incapable to visit any websites. Thus, not able to download the required software to remove the Trojan horse virus infections. Other types of Trojan horse viruses can modify the computer's DNS settings or add various entries to your operating system's Hosts file. That makes it really difficult to connect to the Internet. Mostly, the Ctrl + Alt + Del (also known as the three-finger-salute) allows the users to see what programs and applications are causing the problem. But there will be a possibility where the users won't see any unyielding programs despite the inconvenience they’re already experiencing. They might also try to solve this using the Start Menu but nothing happens when they do the right-click on the desktop. Also, the antivirus won’t operate at all. The virus is performing actions to prevent the end user to eliminate the malware. That’s a clear sign of a Trojan horse virus existing in the user’s endpoint. The changes that a Trojan horse virus are not limited to security settings, it can also change an endpoint’s language. This is a very easy way to restrict the user to resolve the problems because he/she can’t understand whatever’s written on his/her endpoint. The user’s important files that are missing might under the manipulation of a Trojan horse virus. It can delete or encrypt information, or move the files to another place. Comodo AEP provides security and protection against Trojan horse viruses as an anti Trojan virus because it applies the containerization technology. It helps applications to be securely performed as it gets contained in a separate environment. This is very much helpful when a user runs and operates any unauthorized program that is potentially vulnerable. Therefore, it prevents it from corrupting the endpoint or limiting data access. The following features are specifically designed to be an anti Trojan solution to any business. These features help promote a healthier, safer endpoint environment that employees can use. Comodo Advanced Endpoint Protection (AEP) allows users to have visibility and control over what applications are installing on their endpoints. This applies to both desktop/laptop and mobile. Besides, Windows applications can be set to run, be blocked or run only inside the secure container. It makes the Comodo AEP as a very effective anti Trojan virus solution. Comodo integrated IT and Security Manager (ITSM) to Comodo AEP that gives management tools for security policy management and deep visibility into the security posture and well-being of the enterprise endpoints. ITSM device and inventory management capabilities allow for the remote provisioning, configuration, and control of Android, iOS, Mac and Windows-based devices—from a single pane of glass. This covers tasks such as, restricting what a user can do on corporate-owned devices, remotely wiping devices and locking down hardware and ports. Part of the AEP solution, ITSM delivers complete centralized management and control over all of your organization’s endpoints. This feature is a perfect anti Trojan virus because it allows users to resolve any cyber attack even if they are far away from the network site. The user can restrict/disable enterprise endpoints when there aren’t any company operations. A Host Intrusion Prevention System (HIPS) is an advanced security technique designed to proactively identify and prevent malicious network intrusions. Host intrusion systems are intended to monitor a network’s entire traffic and dynamically prevent threats which can often be missed by more traditional antivirus and firewall solutions. As such, most modern networks will deploy one or more of these systems as part of a layered defense strategy. There are instances that a user can encounter a Trojan horse virus that has a worm-like behavior. If the port is blocked, it won't be able to penetrate other machines in the network. That isolates the attack and prevents worsening of the situation. It is a very well designed anti trojan virus solution that blocks Trojans from the port. Comodo Advanced Endpoint Protection (AEP) combines both superior prevention with the ability to detect/respond to threats as they emerge. Comodo AEP goes beyond prevention provided by conventional signature-based detection and AV. Comodo AEP includes multiple preventative capabilities including AV, HIPS, ongoing Artificial Intelligence/Machine Learning monitoring and layers on the ability to manage and monitor endpoints to quickly resolve issues. Advanced Endpoint Protection provides deep visibility into file activity on your endpoints, detecting malicious behavior that other security solutions may miss, and provides you the control investigate, contain and remediate your entire endpoint environment. The Comodo Advanced Endpoint Protection has a wide range of protection for businesses. It encompasses not only anti Trojan virus solutions but only for malware, virus, worms, and ransomware. This makes the endpoint environment a safe place to work and build connections to existing and future clients. Try it now for free and see the improvement in your endpoint environment!